Java Chickens are a very practical dual purpose bird. They are known to be very hardy and good foragers and good free range chickens. Size: Standard Male: 9.5 Ibs. / Standard Female: 7.5 Ibs. / Bantam Male: 36 oz. / Bantam Female: 32 oz. Comb, Wattles & Earlobes: They have a single comb with five points starting well back on the head and upright in both sexes. They have medium-size, well-rounded, wattles and small earlobes. All are bright red. Black: The beak is black and the eyes are dark brown. The shanks and toes are black to dark willow, though the bottoms of the feet are yellow. They have standard black plumage. Mottled: The beak is horn and the eyes are reddish bay. The shanks and toes are yellow with leaden blue mottles and yellow on the bottom of the feet. They have standard mottled plumage. White: The beak is horn and the eyes are reddish bay. The shanks and toes are light willow with yellow on the bottom of the feet. They have standard white plumage. Special Qualities: They are practical birds who are good foragers, can free range, and are hardy. This breed was developed from Asian imports and was described in literature as early as 1835, but was probably developed well before then. 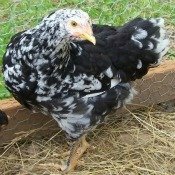 What breeds developed Java Chickens are a bit in question, but the effect that this bird had on other American breeds is evident and well documented. Their bloodline came into effect in developing the Jersey Giant, the Rhode Island Red, and the Plymouth Rock. These birds have a bit of a rectangular build, much like the Rhode Island Red, but have a longer, more sloping back and a full, deep breast. Their comb is also somewhat unique as the first point is set fairly far back, above the eye and not the nostril, which suggests that the breed has pea combed ancestors. These birds are well suited for backyard production as they are docile, fairly cold hardy, and excellent foragers. The hens are excellent mothers and do go broody. They lay a fair amount of medium-size brown eggs. The breed had a white variety at one time that was dropped by the APA in 1910 because it was thought to resemble the White Plymouth Rock too closely. The white variety resulted from a recessive gene, but when the APA dropped the variety, they all but disappeared. Recently, the white chicks have began to pop up again and some breeders are trying to bring the variety back. The breed was first recognized by the APA in 1883.